Grab you share of the work from home niche with Work At Home Moms PLR Ebook and Audio Package. You’ll get Private Label Rights so you can edit. As you know, the work at home moms market has huge customer potential. Also referred to as WAHM, it’s a huge segment of the population, around the world, who want to earn from home. Here’s your opportunity to cash in with a package dedicated to the work at home moms niche. It comes with everything you need to profit madly with this market. From single mothers to married women to want tyo stay at home to raise their family, you sure won’t run out of potential customers any time soon. 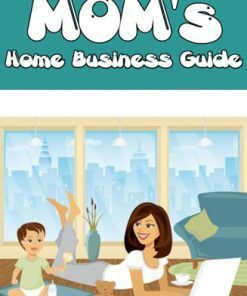 Ebook – High quality ebook packed with over 90 pages of information moms can use to build their own at home business. It comes in Word DOC editable format, so you can change or add to it any way you’d like. Reseller Package – Everything you’ll need to profit with this product is included. Comes with a professional sales page and matching download page, Simply add your payment link, upload and it’s ready to make you money. Best yet, it’s your product, so you keep 100% of the profits on every single one you sell. Sales Funnel – Make even more with every visitor and customer. We’d added some punch to this package with several upsell pages. It comes with a upsell for reprint rights. You could also upsell your customers to the audio version and get higher prices. There is even a download page for a physical product format, if you want to sell physical CD’s. Make more per customer with this additions. Email Messages – 5 day eCourse pre-written for you. It’s a great way to presell your potential customers. It could also be the start of a series to promote other related products and services. Audio Files – 5 high quality MP3 audio files with a professional voice-over. Audio’s average about 25 to 30 minutes each. Again, this could be a powerful upsell for you. Plus, who doesn’t have a device to play MP3’s these days? Pretty much every one, so it’s a perfect upsell match. Banner Ads – Here’s how your going to drive traffic to your new product. These high quality promotional banners come in 10 sizes, so you’ll have one to fit just about anywhere you need it. Sizes include, 102×240, 120×600, 160×600, 180×150, 234×60, 250×250, 300×250, 336×280, 468×60 and 728×90. eCovers – We’ve included the ecover in two different formats, binder and binder with audio. Each comes in 3 different sizes. Plus there are CD cover and flat image. Email Solo Ads – 10 pre-written solo ads you can use to drive traffic to your new sales page. Easy to customize, copy and paste them into your autoresponder service and your done. PSD Graphics – You’ll be getting PSD for just about every graphic in this package, so you can easily and quickly, edit, change or add to the images and brand it as your very own. They include, banners, boxes, ecovers and splashes. 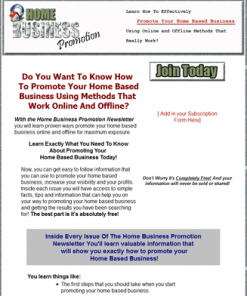 Work At Home Moms Are Making More Money From Their Internet Based Businesses Than Ever Before! You CAN Make Excellent money even if you’re not working full time. Become a highly successful work-at-Home Mom Starting Today! Would you like to make a little extra money to pay a few more bills? Would you like to add a nice chunk of money to your income each month? Do you have a little spare time you’d like to be using for something productive? Maybe you’d like to generate a bigger income for yourself and your family. Whatever your situation, it’s now completely possible. There are thousands of mothers out there making a nice living from the comfort of their own home. You’re about to learn how you can join that exciting group. I’ve talked to a lot of stay-at-home moms who truly enjoy being able to raise their family and spend more time with their kids. However, even though they are at home, the majority of them would like to generate some kind of income. Most of them say that they want to contribute to the household expenses so that they can help cover some of the bills. Others say they want to have some extra spending money to go on a small shopping spree at the end of each month. Some even say that they want to bring home a full time income working from home but don’t think it’s possible. Traditionally, when people think of “work at home moms” they think that the majority of people (men or women) can’t make an Internet based business work. Combine that with the fact that a mother at home has a lot to deal with when it comes to children already and you can see why disbelief sets in. Sometimes children are two full-time jobs rolled into one! The good news is that you can create a successful Internet based business from home if you just have a few simple tools a system to follow. You don’t have to be some super expert when it comes to business skills or have all kinds of experience to make this happen either. In fact, moms who work at home have more potential to start an online business than most people because they are already great multi-taskers. This is a much needed skill that is pre-existing and brought to the table by the majority of mothers starting a business. Parents and anyone who has taken care of children have a bit of an advantage when it comes to maintaining a home business. .
As we previously hinted at, parents are naturally great multi-taskers! 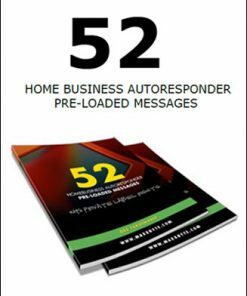 This task is the number one skill required to start a successful home based business in your spare time. If you have this skill and a blueprint for creating a thriving business, you have everything you need to make it. This natural talent of multi-tasking comes from being a parent and taking care of a home. Can you say feed the kids, clean the kids, watch the kids, run the kids around, cook, clean, tidy up, run errands? Sadly, while most parents have an advantage when it comes to starting an Internet based business, the majority of them never will. This sad truth is a result of negative thinking that they just can’t make it in the online business world from home. Most people feel a bit overwhelmed at the fact that a person can start a business at home. Don’t get me wrong, this would have been a very valid thought about 5 years ago. Back then the Internet didn’t have all the technology that is currently available and automation tools weren’t easy to find. This made starting a business a long drawn out process which included a ton of complication, stress, and time that most people don’t have. No wonder most people didn’t want to get started! Because of new technology, there are a ton of resources available to moms that make creating a business a lot easier and faster. This means that a you can work on your business in between soccer games, after dinner, or before doing the laundry. Automation tools make doing mundane tasks a thing of the past and allow the work at home mom to do more work in less time. Combine this new technology and automation resources along with a mother’s natural multi-tasking talent and you have a recipe for success! This is a new day with new possibilities for work at home moms the world over and tons more women are becoming more successful than ever before! Are you ready to become the next work at home mom success story? impress your friends, have more money, and enjoy the luxuries that more money can Deliver! Do you want to make more money so that you can help offset the rising cost of utility bills? Maybe you want to make some extra cash so that you can buy a nice car for yourself and roll around in luxury when you’re running around the kids. Or maybe your goals are bigger than all of that and you want to make thousands of dollars a month, get a nicer house, and really take control of your life. Whatever you would like to achieve, it’s all possible if you’ll follow a simple plan for getting to success, and stay with it faithfully as a work-at-home mom. As we said earlier, moms (and dads) have a natural talent in multi-tasking and being able to juggle various things at the same time. Combing this talent with the newest technology and automation tools is something that can really accelerate your success. In order to be successful, it’s vital that you have a blueprint that shows you how to create a business the right way. I’m talking about a proven, battle tested system for creating a home based business that actually works. It’s this blueprint that I’ve been refining and perfecting over the last few years.. I also realize that some people have no business skills to speak of and that’s okay too! There’s still work you can do for income! The good news is that this secret system is done and ready for anyone who wants to create a business to grab and start using. You just follow the steps, take the actions I tell you to, and use the tools and resources I share and you’re well on your way to creating all of the success you could dream of in your Internet business. It’s as simple as following the steps. That’s the beauty of this system! There is no “too busy” when it comes to the system that I’ve put together and it’s extremely simple implementation. Even if you only have 10-15 minutes at a time and are constantly interrupted, you can do this and make money! Best of all, this isn’t some fluffed up, watered down, 500 page manual that you’ll never have time to read. I respect your time and I know that you need something that can be used quickly. This system is fast to read, even faster to start implementing, and proven successful for work at home moms just like you. Ready To Pull In Some Extra Income? Put that much needed extra cash into your bank account every month while working from home! One fast reading manual that you can digest quickly and act on! so easy to do that even extremely busy parents can do it! read the manual today and get started building your business tonight! make extra income regardless of how busy you are! no experience? No problem! Any experience level can do this! It’s now easier than ever for a work at home mom to create a highly successful business in Internet Marketing by following this proven blueprint! Look, we talked about several scenarios when it comes to your desires for starting a business. If you follow this plan you can certainly get there with some dedication and motivation. Even if all you have is dedication in 10-15 minute bursts because of your hectic lifestyle, you can STILL make this happen. The Work-At-Home Mom’s manual was designed that way! You’re going to discover why moms all over the world are taking the big step and starting businesses that not only survive, but thrive online! Road Blocks – This is where you are going to learn about the major roadblocks most work at home moms face when starting an at home business and how to blow through them once and for all. Mandatory Information – this is the most important section of the manual that reveals unique business information for work-at-home parents such as time management and effective online communication. Analyzing Your Skill set – regardless of your skill set you’ll learn how to find jobs you can complete for income. Even if you think you have no skills, we have jobs you can apply for! Locating Jobs – Where to look to find jobs that pay well and that fit into your criteria for working at home as well as your time schedule of working and project delivery! Landing Jobs – how to position yourself as the shining choice when it comes to jobs that you apply for so you get more work, make more money, and have more repeat clients. Completing Work & Customer Satisfaction – the best way to do your work to Ensure The highest quality possible while also making sure that your customers are extremely satisfied! Tools & Resources – all of the best tools to help you in keeping organized, doing your work, and interacting with your clients so that you work efficiently and quickly! Are you ready to join the ranks of successful work-At-home moms and start generating some much needed extra income? 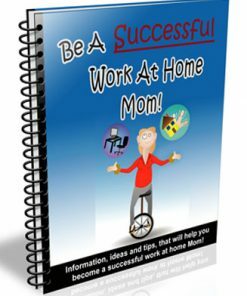 The Work-At-Home Moms manual gives you everything you need to be a success if you’ll just apply what you learn. This manual focuses on your natural talent for multi-tasking as a mother and uses that as a strength to help you become successful as fast as possible. There has never been a manual that focuses on this key characteristic. Do you need a few hundred extra dollars this month? 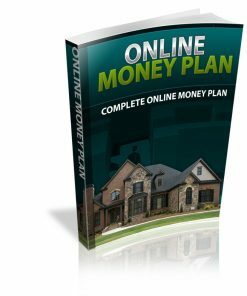 If you’re ready to start generating some extra income, whether it be a few hundred or a few thousand dollars a month, you have to get started today. The faster you get started, the faster you can start getting clients and building a roster of existing clients you can get repeat jobs from. Once you get a roster of previous clients, you won’t even have to look for jobs any longer because you’ll have a constant stream of work waiting for you.